This is my new Bisley gripped BFR "6.5" 475 Linebaugh/480 Ruger. Brand new! I'm thinking about having the Precision Center make me one in 454 with a 45 ACP spare cylinder. Very nice, yes that would be a seriously cool toy to add to your collection! Ruger GP100 with walrus ivory inserts. Action job by the late Teddy Jacobson (Actions By "T"). 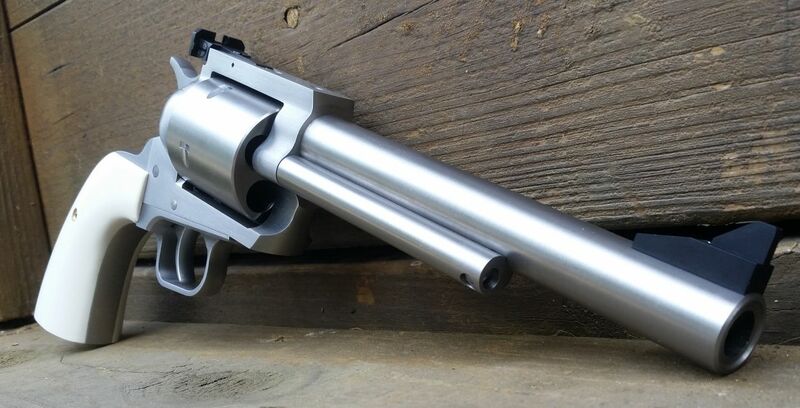 HERE ARE TWO 5 INCH N FRAME REVOLVERS, A GREAT BARREL LENGTH FOR GENERAL FIELD USE/CARRY. THE TOP 1 IS A MODEL OF 1989 IN 45 COLT (A RECENT ADDITION) THAT I WILL USE WITH MY OLD WEST LOADS (A 250 gr OTBC CAST FPRN @ AROUND 900 fps), AND THE BOTTOM 1 IS A 5 INCH MODEL 27 357 MAG THAT I HAVE OWNED AND USED FOR YEARS (I USE OTBC 158 gr CAST BULLETS IN IT). BOTH GUNS ARE WEARING STABILIZED ELK STAG GRIPS BY KEN DRISKILL. CLASSIC REVOLVERS. I have those same two 5 inchers myself. The 25-7 is a fantastic gun. I shoot similar loads in mine too. Your grips look great. Generated in 0.073 seconds in which 0.043 seconds were spent on a total of 14 queries. Zlib compression enabled.